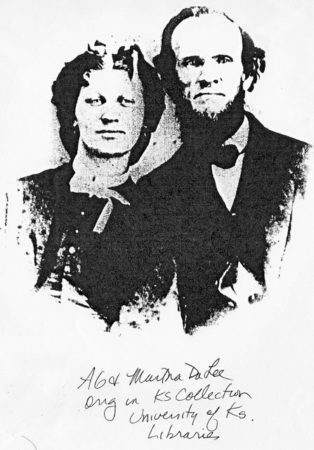 Initially A.G. DaLee opens his studio in Lawrence, Kansas; at some point his wife, Martha, joins him. They run the studio together until his death in 1879. Later Elmer Willis branches out on his own, down the street from the Da Lee Art Gallery, and in 1895 marries Eliza DaLee, A.G. and Martha DaLee’s daughter. Eliza and Con Squires run the old Willis Studio, which they re-brand as the “Squires Studio”, until Con Squires dies in 1916. After Con Squires’ death, Eliza moves away and marries a man named Alfred Fey, and eventually they settle back in Lawrence, running the Squires studio until they retire in 1934. 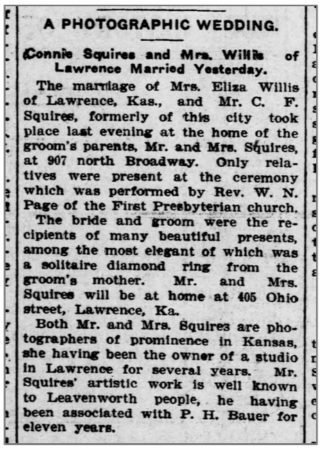 It’s a bit confusing; the following article indicates they lived and worked in Kansas City after they got married in 1917, but other records indicate they were running the Squires Studio in Lawrence earlier than in this article. Eliza DaLee Willis Squires Fey’s story is not always straightforward, as I discuss in the episode. However, I do have a correction about a date; in the audio of the episode I refer to a 1932 profile of Mrs. A.P. Fey formerly [Eliza DaLee, also aka Lida DaLee]. The correct year for that profile is 1933, not 1932. The transcript below has been updated with the correct date. Support for this project is provided by listeners like you. Visit my website at p3photographers “dot” net for ideas on how you, too, can become a supporter of the project. Today we’ve traveled to Lawrence, Kansas, and our first connection today is to a woman named M.A. 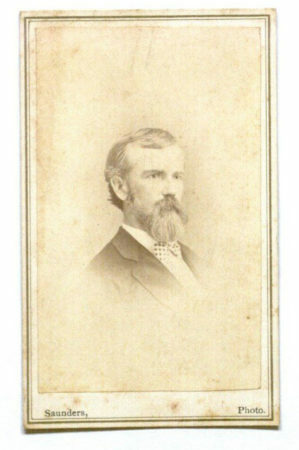 Kennedy, who was active as a photographer in the 1860s in Lawrence, Kansas. Now, M.A. Kennedy is a bit of a mystery woman. She was definitely running a studio called M.A. 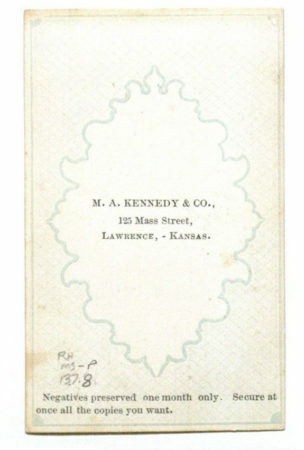 Kennedy and Company, starting as early as 1866. I want to thank Monica at the Watkins museum in Lawrence, Kansas, for finding the tax record from October 1866 which says that M.A. Kennedy was running that studio and paying taxes on it . The earliest I’d found for M.A. 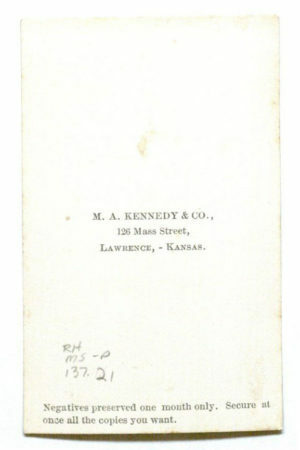 Kennedy had been a newspaper clipping in the Lawrence newspapers in 1867. But clearly M.A. Kennedy was there a little bit earlier. I’m calling her “M. A.” Kennedy because those are the initials that are on the backs of the cards that her studio produced. 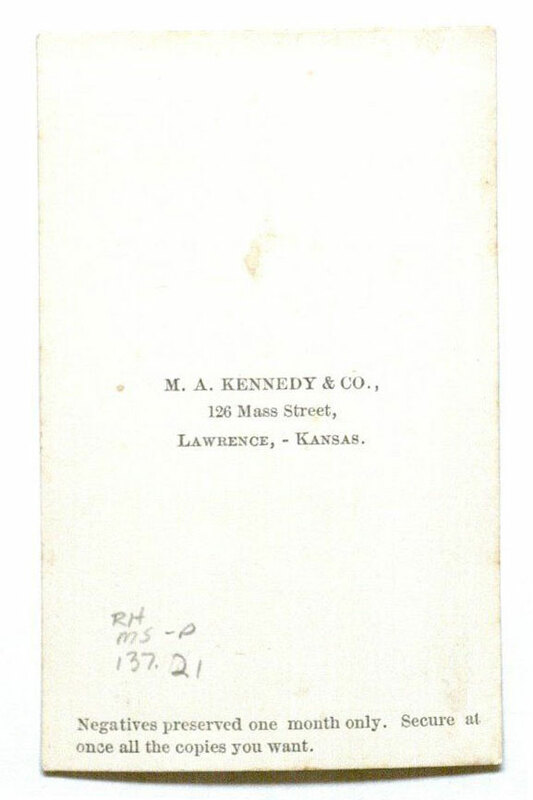 Unfortunately, when she’s listed in any of the Lawrence directories, she’s always listed only as “M.A.” [Kennedy]. There’s one really muddled handwriting entry in the 1870 census for Lawrence, Kansas, and it’s possible that it says “Martha” Kennedy, i.e. Martha as her first name. But I’m not so sure – it is really hard to read. So I’m gonna have to call her “M.A.” in lieu of knowing definitively what her first name really was. M.A. Kennedy opens her studio in Lawrence, Kansas, and as I said it’s called “M.A. Kennedy and Company”. She is described in newspaper notices as being a photographer, but at one point she hires a man named Saunders to be one – at least one of – the photographers at her studio. Photographs that he produces — the Carte de Visite, which are the small-sized cardboard-kind of photos — well, the ones that he produces have his name on the front, but then “M.A. Kennedy and Co.” is stamped on the back. So, Saunders was the photographer at least for part of the time at the M.A. Kennedy studio. Unfortunately, he dies in 1871, and all the notices in the paper after that talk about M.A. Kennedy as the photographer [at the studio]. Now I’ve been deliberately avoiding the notion of “Miss” or “Mrs” or using some sort of title with her, because most often she’s described as MIss Kennedy. [However], there is one mention in 1874 where the notice says that it’s Mrs Kennedy’s studio. But that’s the only notice that says Mrs, and in that census in 1870 she is listed as a single woman. In the newspapers that survive from Lawrence from that early period there are notices and ads for her studio. And there are numerous Carte de Vistes [photos[ that have survived [produced by her studio] that are available. You can [often] find them either on eBay or the Spencer Research Library at the University of Kansas has a number of them; the Watkins Museum collection has a number of them. So, we do know that [M.A. Kennedy’s studio] was a very active, thriving studio. One of the notices in the paper says that there at one point there was actually a wedding that was held right in the studio; that was in 1873. So her studio is very very active. But then in 1874, sadly, there is a fire in M.A. Kennedy’s studio. It does a bunch of damage … doesn’t destroy the place. But I’ve got to wonder if that was what led her to want to go off on a trip with friends in 1875. There’s a writeup in the paper that says that a group, including M.A. Kennedy, is off to California but hopefully they’ll all come back and take up their jobs again in Lawrence, Kansas. Actually, though, that doesn’t happen with M.A. Kennedy; there’s a notice that says she’s not coming back. Her studio is closing, and she’s going off to California. But there is no trace of M.A. Kennedy after that, so I don’t know what happened to her. Based on that 1870 census, that indicates that she was born in 1839. So in 1875 she wouldn’t have been quite 40 years old. It’s possible that she went off and got married … it’s possible that she set up shop [elsewhere] and actually used a first name that was something that I wouldn’t have guessed … and didn’t use a middle initial … Kennedy is not that uncommon in name, and there are lots of photographers who are Kennedys. My husband, Chris, who does some of this research, too, he actually ran across Mr M.A. Kennedy in Kansas about ten years later. This Mr M.A. Kennedy is a photographer. And it is really intriguing to speculate that maybe [the woman from Lawrence] decided to adopt a masculine dress and start passing as a man? Chris and I have been [recently] running across stories that were in the paper about women who actually did this. So I think that put the idea in our heads. But I have no actual proof that the Miss M.A. Kennedy who ran this early studio in Lawrence, Kansas, was actually a person who claimed to be male 10 years later. But it is an intriguing thought. But we don’t need intriguing fake narratives for M.A. Kennedy, because I actually have two things that I think are really plausible, or at least are posited as plausible, that involved Miss M.A. Kennedy, the photographer in Lawrence, Kansas. As I said, her studio was up and running as early as 1866. In 1867, a photographer named Alexander Gardner actually passed through Lawrence, taking a lot of pictures in town, pictures that the Watkins Museum in Lawrence has, some of which they have blown up and displayed as huge posters there at the museum. One of Alexander Gardner photos is a photo taken from the next block down from M.A. Kennedy’s studio. So it’s really intriguing to think that M.A. Kennedy was definitely there at the same time as Alexander Gardner. 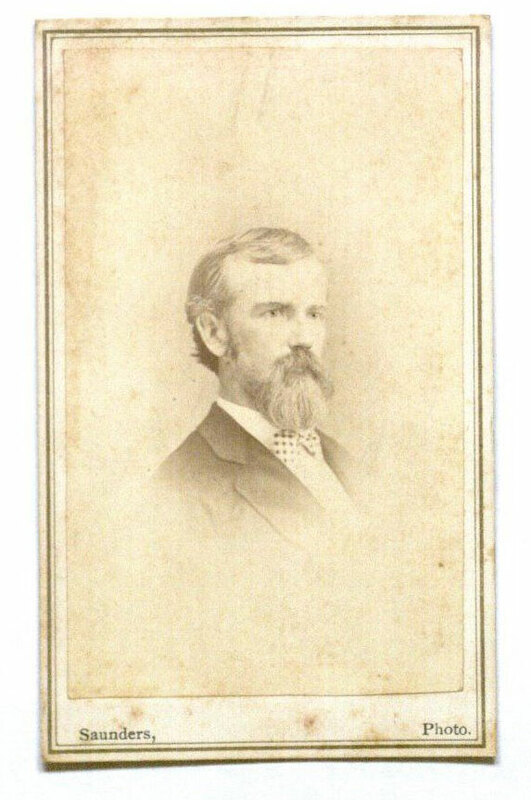 Now, Alexander Gardner was one of the preeminent Civil War photographers, having worked for Matthew Brady for awhile, but was famous in his own right. So it was interesting to think about the connection between photographers. M.A. 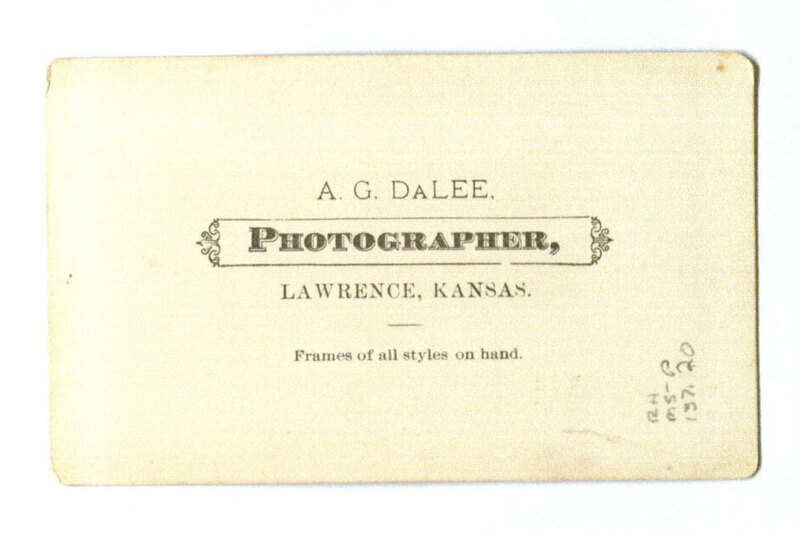 Kennedy is working in Lawrence, Kansas, and Alexander Gardner, who just a couple years before had been taking pictures during the Civil War (and very famously getting acclaim for that) comes to town, and is taking pictures there in Lawrence, Kansas. So I do think that M.A. Kennedy and Alexander Gardner could have met. So that’s one connection which I think is very plausible. Now, there’s another story connected with one of M.A. Kennedy’s photos that has been hotly debated [regarding] who the subject in the picture really is. 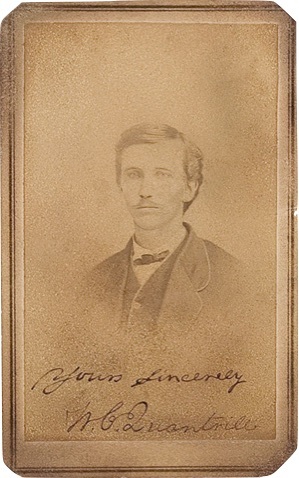 There’s a picture that’s dated to 1863 or earlier, taken of a man named William Quantrill. The picture in question has on the back the stamp of M.A. Kennedy and Company, so the same kind of stamp that we find on a lot of the other existing photos from her studio. As I said, the earliest evidence I have for M.A. Kennedy’s studio there in Lawrence actually had been 1866. The reason that this picture of William Quantrill has to be earlier than 1863, though, is because this William Quantrill is quite famous — really infamous — for being the leader of Quantrill’s Raiders. Now this was a pro-Confederate group — they were called “bushwhackers” — who conducted raids all over for a short period. But in August of 1863 they conducted one of their most deadly raids in Lawrence, Kansas. The reason I bring this up is that this picture by M.A. Kennedy is supposed to be of William Quantrill. Experts about William Quantrill disagree whether or not this is really of him as a young man. If it is, it’s from much earlier than our evidence for M.A. Kennedy’s studio in Lawrence. Which is interesting because it would actually put her back in Lawrence in the early 1860s. Because, of course, this can’t [have been taken] after 1863, because eventually Quantrill is killed. [And besides], he would not have been coming back to Lawrence to get his picture taken in a studio in Lawrence when he’s just conducted this huge deadly raid on the town [in August of 1863]. So that’s one interesting connection, just to think, maybe she actually took a picture of this guy before he became infamous. 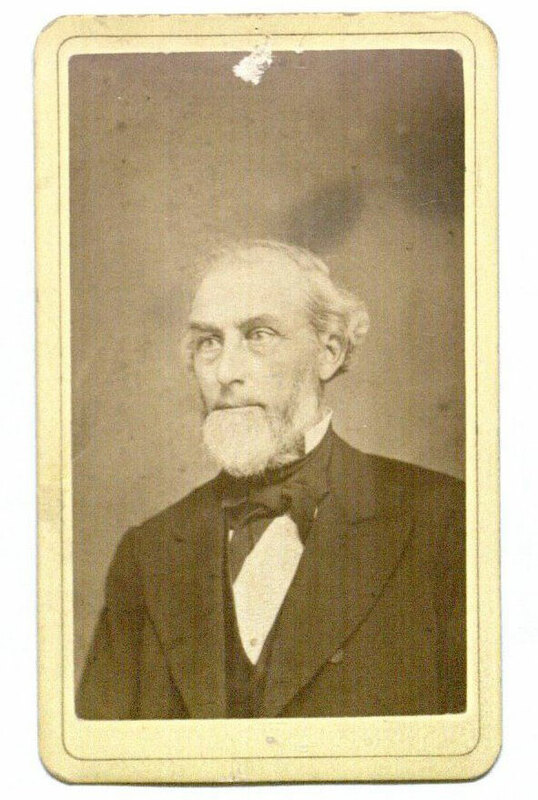 But the other interesting thing was that [this story] brought to light in my research a whole side connection to one of the other photographers in Lawrence, Kansas in 1863. So, a gentleman who actually was running a studio in 1863 when the Quantrill Raiders came to town. That was a man named A.G. DaLee. Now, A.G. DaLee was running a studio – he was actually one of the first pioneer photographers in Lawrence, Kansas. He opens his studio in the late 1850s. So in 1863, when Quantrill’s Raiders come to town, they’re targeting men and boys. They storm into DaLee’s house and studio, and force him to the basement, where he — where they shoot him. Now, his wife runs out into the back (Quantrill’s Raiders famously did not kill women and children, at least not in Lawrence). So she’s able to run out the back. And the Raiders set fire to the house and leave, thinking that they have killed this photographer, A.G. DaLee. But he makes his way to the window, and he taps on the window to get his wife’s attention in the backyard. She comes in and is able to drag him out of the burning house, and hides him in the bushes so that if the Raiders come back they won’t see him there in the yard. Then she runs for help. Luckily, the bullet passed through his shoulder, didn’t hit any vital organs, and he actually survives and continues to run a studio there in Lawrence, Kansas. In the late 1860s, when M.A. Kennedy was definitely in Lawrence, Kansas, one of her competitors was actually this A.G. DaLee. So if we fast forward to 1879, A.G. DaLee is still running the DaLee studio in Lawrence, Kansas, along with help from his wife Martha. Now Mrs DaLee, may or may not have been a photographer back during the Civil War period, but definitely by the late 1870s she is operating that studio with her husband, A.G. Unfortunately in 1879, A.G. DaLee has become sick, and so the family decides to go to Colorado Springs for vacation in the summer of 1879, with the hope that he’ll recover. The family sets out; it’s A.G., his wife Martha, and their five year old daughter, Eliza. Sadly, A.G. DaLee does not recover in Colorado Springs. In fact, he passes away there in August of 1879. A.G. had been quite prominent in Lawrence, Kansas, and so his obituaries not only talk about all of his accomplishments as one of the pioneer photographers in Lawrence, but also detail that story about how he survived the Quantrill Raid. A.G. DaLee ran a studio for over twenty years before he died in 1879. Mrs. DaLee will actually go on to run the studio for more than another twenty years. She has quite the success running that studio. Mrs DaLee’s studio gets mentioned in the newspaper; she is also mentioned as being very active in the social scene there in Lawrence, Kansas. She often will hire assistants, other photographers who will come and work with her there in the studio. And that includes a young man named Elmer Willis, who is hired as a teenager to come work for her in her studio. In fact, she takes him on as a boarder, so that he actually lives with her and her young daughter, Eliza. When Elmer Willis turns 21, there’s a big article in the newspaper about how she’s thrown him this huge party to celebrate his 21st birthday. So in some ways, he’s almost seemingly like family to her, [at least judging from] the write-ups in the newspapers. 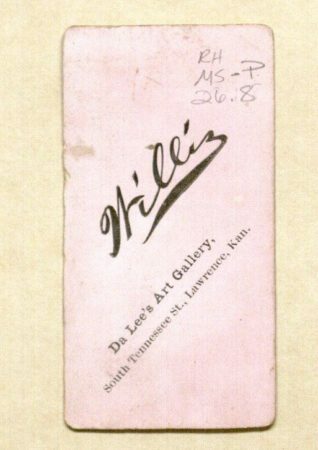 In the early 1890s Elmer Willis leaves Mrs DaLee’s studio and opens up another studio a couple blocks away, called the Willis Studio. And then, in the mid 1890s, Elmer Willis actually does become family to Mrs DaLee, in 1895, when he marries her daughter, Eliza. Elmer and Eliza Willis then are the proprietors of the Willis Studio. Now it’s not clear exactly when and where Eliza became a photographer. At one point [in the early 1890s] she’s off studying singing in Kansas City. But when she’s eighteen she actually does get married to Elmer Willis, and from then on she is always mentioned as a photographer. In fact, both she and Elmer are award winning photographers, winning awards at the Kansas photographers association annual conventions. So the Willises are successfully running their own studio. Around the late1890s, it seems like Mrs DaLee closes her studio; whether it was ever actually an active competitor to the Willis Studio once her daughter marries Elmer Willis, it’s just not clear. So, as I said, Elmer and Eliza Willis get married in 1895. They are running their studio together very successfully until 1902, when Elmer Willis goes off on a business trip. The next thing you know, unfortunately, from the newspaper accounts is that Elmer died off on that business trip, of a sudden mysterious gastrointestinal thing. Eliza vows to carry on the studio. And then 6 months later, she actually remarries, to a man named Con Squires. Now Con Squires is himself a photographer. And he actually was working for the Willis Studio the summer before poor Elmer Willis died. At this point, Eliza Willis is now Eliza Squires. 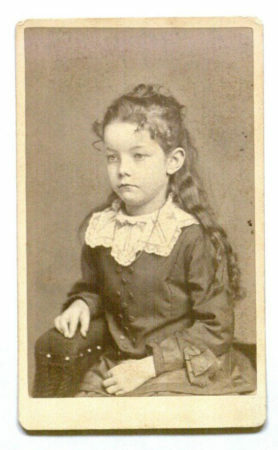 Again, she started as DaLee; her father was A.G. DaLee, her mother was Martha DaLee, so she came from this photographic family. She married her first husband, Elmer Willis, who was a photographer. He dies, and she marries Con Squires, also a photographer. And together they continue to run what had been the Willis Studio, but what is rebranded as the Squires Studio. The Squires Studio is really successful as well — probably even more so than the Willis Studio. It gets bigger …. it opens multiple branches. Con Squires is just super popular, always mentioned in the papers, but Eliza is right there running the studio and being a photographer alongside him. And they are doing extremely well. I mean, for the next fifteen years (almost) they are running the Squires Studio very successfully there in Lawrence. But then in 1916, Con Squires goes off on a business trip. And he dies while off on a business trip, again of a mysterious gastro-intestinal ailment. He is super popular, he has a huge set of obituaries that are in the paper, about the fact that he’s died so suddenly. But his widow has vowed to carry on; his widow, of course, being Eliza [Squires]. When Con Squires dies, though, there are actually several outlets for the Squires Studio there Lawrence. Mrs Squires, in other words Eliza Squires, well, she maintains control of one of the studios, but then there’s a notice in the paper that she’s going to go off and try to recover, as she’s grief stricken, that kind of thing. That is understandable, of course; I mean, this is the second time it’s happened that her husband has gone off on a business trip and died. And also a little bit odd. Anyway, it’s a little bit of a surprise a few months later when there’s another notice that she’s actually coming back to town, taking control again of the Squires Studio that she had maintained ownership of. And she’s coming back with another husband in tow, a man named Alfred Fey, spelled “F e y”. Now, Alfred Fey was not a photographer when she married him, but according to the [newspaper] articles she teaches him how to do photography as well. Now, as I said, the Squires Studio had been around for almost fifteen years and was extremely successful, so it’s not surprising that Mr and Mrs Fey (that’s Eliza and Alfred Fey) decide not to mess with that brand. So it’s still called the Squires Studio, even after Eliza marries the man named Alfred Fey. The Squires Studio continues to be a real success there in Lawrence and beyond; they get notices in the paper, they are winning awards, I think, still here and there. Mr and Mrs Fey are celebrated in town as photographers. Then in 1932 [correction: 1933] there’s what I call a “puff piece” about Eliza in the newspaper. And it outlines a little bit of her background, and sort of the tragedy of how Con Squires died, but then she met and married Alfred Fey, and he learned photography, and together they really make a go of the Squires Studio. But there are a couple of curious things in that piece on Eliza DaLee Willis Squires Fey that don’t really add up. Let me just explain where I have a little bit of a problem here. Because, as I said she’s the daughter of A.G. DaLee and Martha DaLee. Both of her parents ran photography studios, each for at least twenty years if not a little bit longer. But in the article about Eliza in 1932 , long after both of her parents are dead, Eliza doesn’t talk about her mother ever having been a photographer. She talks about how her father was a photographer, and how she learned photography using her father’s lens, which is really nice as an image … except she would not have learned it from her father, or least probably not, because he died when she was only five years old. OK, well, minor point [perhaps]. But then the other curious thing is that, as I said, she married initially to a man named Elmer Willis, and together they had a very successful studio. I mean, they both won awards for their photography. But in this big interview in the paper in 1932 , there’s no mention of Elmer Willis at all. It’s like she went from being a DaLee to being Mrs Squires. 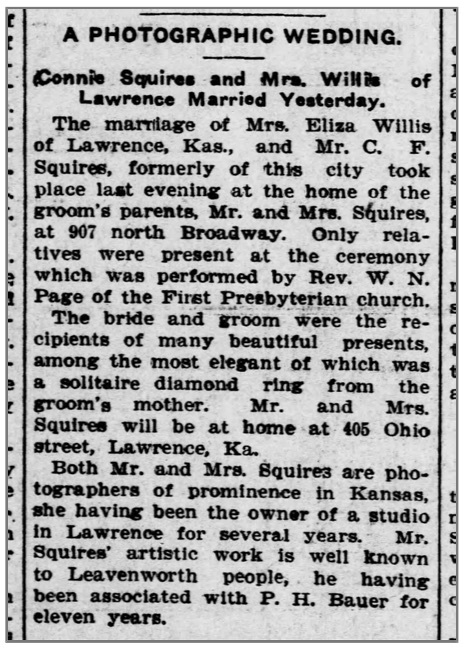 No mention at all how about how she and Con Squires actually took over this studio that had been hers with her first husband [Elmer Willis]. So it’s just really curious how people sort of reinvent their past. And maybe in 1932  to this was a better way to present herself? It definitely was the case that in 1932, I think business was starting to slow down, probably because of the [Great] Depression. And so maybe the idea behind this big interview with Eliza was really to help generate a little more publicity for the studio, to try to boost their sales, which were perhaps lagging. I mean, around that time, a lot of photography studios did go under because people no longer had the money to afford to get their pictures taken. And in fact it’s only just a couple of years later when the Squires Studio does in fact shut down. 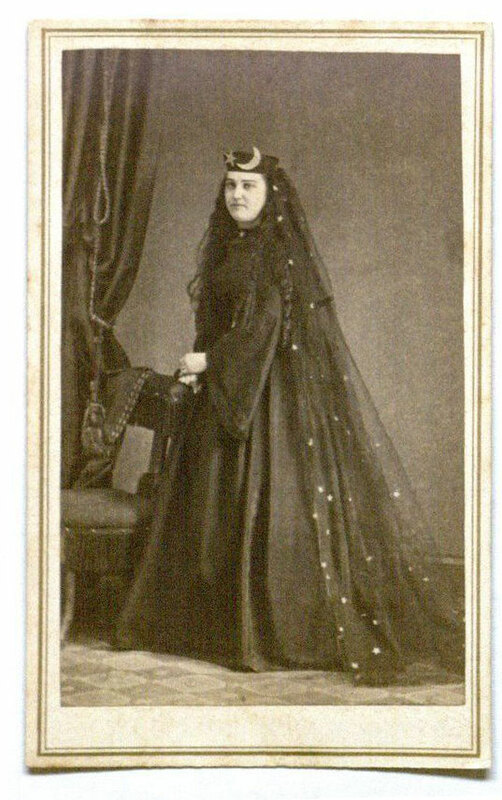 But I really find it fascinating that Eliza had such a long career as a photographer, but really doesn’t give a lot of credit to some of the people who were integral to her story, like her first husband, and of course, her mother. Now, she does give credit to her uncle, William Lamon; she says her uncle actually taught her photography. And that, of course, could be true. 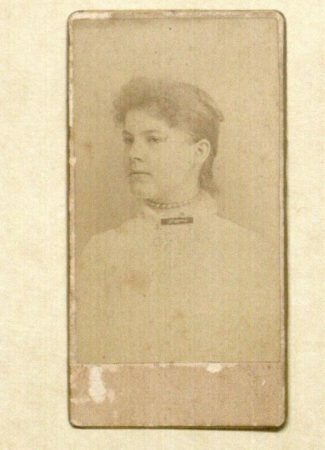 Her uncle was another photographer there in Lawrence; he was a contemporary of her father and actually of that M.A. Kennedy, all of whom were early photographers in Lawrence. And then later on, of course, Eliza and her various husbands form the backbone of one of the most successful chains of photography studios in Lawrence. They were not the only ones, and I’ll be talking about some more of them in the next episode. But the DaLee, Willis, and Squires connection is just really an impressive stretch of success for one family of photographers. Now, the DaLee family of photographers in Lawrence, Kansas run studios there for over seventy years, and that’s pretty exciting. But as it turns out, in Lawrence, Kansas there was actually another family of photographers who wind up running studios there in Lawrence for even a little bit longer. That family’s last name is Shane. 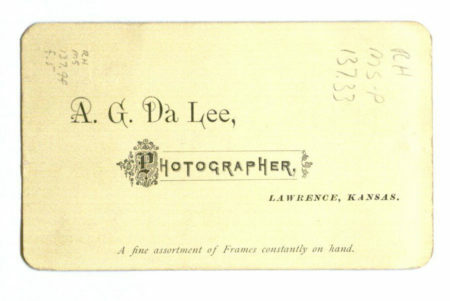 And the first Shane Studio is opened in Lawrence, Kansas in 1879, that same year that A.G. DaLee dies and Mrs DaLee formally takes over the DaLee Studio. The Shane Studio is initially run by J.B. Shane and his wife. In addition to their success as photographers, the Shane family has some interesting backstories all of their own, which are going to have some interesting connections to other photographers and other events as well. Those stories are what I’m going to be bringing you in the next episode. Before I end today I do want to thank several people. First of all, Monica at the Watkins Museum of History was extremely helpful and generous with her time, not only in finding that tax record for M.A. Kennedy, but also for finding some photos by the Kennedy, DaLee, Willis, and Squires Studios. Also, I want to thank the folks at the Kenneth Spencer Research Library at the University of Kansas Libraries. Beth, Kathy, and Caitlin were all extremely helpful in my research on women photographers there in Lawrence, Kansas. And Kathy and Beth were particularly nice in letting me stop by and give a talk to the staff back in April on the women photographers of Lawrence. The folks who attended that lecture actually got a little bit of a preview of material in today’s episode and also material I’ll be bringing you next time. And that reminds me …I do give presentations and workshops about these early women photographers. I tailor the material to include women and subjects to match the interest and areas of the groups that invite me. If you’re interested in having me stop by to give a talk, just contact me at podcast “at” p3photographers.net. For the episode notes for today, I’ll be sharing some of the photographs that I got from the archives there in Lawrence, as well as some other materials that I’ve mentioned. As always, those materials will be available on my website at p3photographers.net. That’s letter “p”, number “3”, photographers “dot” net. If you run across anything related to any of these women photographers, or if in general you have any questions or comments about the project, just drop me an email at podcast “at” p3photographers.net. This podcast relies on the support of listeners like you. One free way to help more people find the podcast is to leave a 5 star rating and review on Apple Podcast (formerly known as iTunes.). Next time we’re going to stay in Lawrence, Kansas, exploring the connections between the photographers from today’s episode and their competitors from the Shane family. Until then, I’m Lee, and this is Photographs, Pistols & Parasols. Author Lee McIntyrePosted on July 15, 2018 July 15, 2018 Categories DaLee, Martha, Episodes, Fey, Eliza DaLee Willis Squires, Kennedy, M.A.